Handmade Detroit | DUCF T Shirts, Hot Off the ESP Presses! DUCF T Shirts, Hot Off the ESP Presses! ESP, Essential Screen Printing, has been a sponsor of DUCF for years, and prints all our T shirts, bags, and sweatshirts. Every year they knock it out of the park, and this year is no exception! Melissa Dettloff designed this year’s T shirt from her poster design, and ESP did a great job matching the colors and carrying the magic of the poster to the shirts! 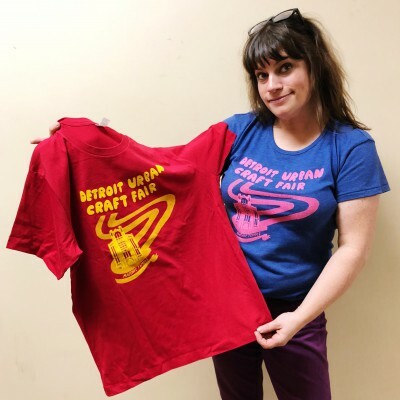 You can buy men’s and women’s fits this weekend at the Handmade Detroit booth in Detroit Urban Craft Fair while they last. If you’ve got a T shirt design or a whole line in mind to make, contact ESP! They are located in Eastern Market and Scott, Anna and the rest of their team are a dream to work with.